Jeppesen's Indian agent Gana came through for me. 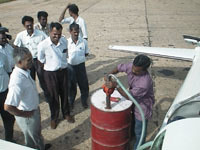 Just as I was retiring for the night at my Chennai hotel, he telephoned from Trivandrum with the good news that the local flying club had agreed to sell me up to 150 gallons of avgas if I needed it. What a relief! Gana had recently retired from a long, distinguished career as a fighter pilot in the Indian Air Force. He was obviously used to getting things done, and fast! The next morning I arose early and headed back to the Chennai airport for the short flight to Trivandrum. This time it took FIVE HOURS to navigate through the bureaucracy, get fuel, and begin taxiing for takeoff. The Indian government is obviously committed to creating as many civil service jobs at the airport as possible, as I was required to fill out, and obtain official approval of, multiple forms in countless offices before I could return to my plane. An example of this ridiculous employment featherbedding was the requirement that I spend more than ten minutes in one office filling out forms to APPLY FOR a weather briefing package, which I then obtained by turning in those forms and securing their approval at yet another office in another location. The weather briefing envelope I finally received was outdated, skimpy, and for all intents and purposes, useless. Thankfully, Jeppesen had faxed a thorough briefing package to my hotel before my departure in the morning, so I could ignore this "official" one. Despite this, Indian regulations mandated that I apply for and obtain one of theirs. There was one official stop that I'm glad I was required to make. Each pilot leaving Chennai that day was required to report to an office staffed by Indian Air Force personnel for a military briefing. A young lieutenant greeted me there with a pleasant welcome and reviewed my proposed routing to Trivandrum. I had prepared a flight plan that skirted down the Indian East coast to my destination, since Indian aeronautical charts were clearly placarded that foreign registered aircraft were prohibited from overflying certain sectors of the country's interior. The reason for this restriction was the recent discovery that small, foreign aircraft had been dropping weapons and ammunition to certain criminal and rebel elements in southern rural areas. By limiting such aircraft to an offshore routing, these nefarious activities were less likely to occur. Now, however, a more urgent problem had emerged. A day or so earlier a private nonmilitary aircraft flown by Russian pilots in the airspace between Sri Lanka and India had been downed by Sri Lankan rebel fire. This was just what the American embassy official in Colombo had warned me about just a few days before! In any case, the prudent response of the Indian government was to prohibit all flights down the coastline near Sri Lanka, and instead to reroute them over the previously restricted inland routes. I was therefore automatically granted a much shorter overland route to Trivandrum. Boy, was I glad now that I'd come to India instead of Sri Lanka. Bureaucracy and excessive fees seemed to fade from my list of serious concerns for awhile! The flight to Trivandrum took a short 3.1 hours. It was hot, there were monsoon thunderstorms everywhere I looked, and I had to wend my way between 7,000 ft mountain peaks at the southern tip of the subcontinent before touching down in the late afternoon at Trivandrum. I'd spent the entire day wading through endless paperwork all to be able to make such a short domestic flight. The Trivandrum tower controller was obviously expecting my arrival, and he had me taxi to a little hangar located on the opposite side of Trivandrum's single, long runway. Upon reaching the humble structure, the Mooney was surrounded by at least a dozen men led by a proudly smiling Gana. These fellows turned out to be members of the flying club, and they quickly rolled out three barrels of avgas and began working in teams to hand pump fuel from the barrels into the plane. It was a slow, tedious job, but as far as I could tell, a good time was had by all. I was then treated to a friendly dinner with the entire group at the Indian Airlines employee cafeteria over in the terminal building, followed by a short car ride back to the plane. By this time of the day I was quite tired, and I inquired of Gana about the possibility of spending the night at Trivandrum to rest up for my next leg. He again warned that I could not possibly hope to obtain permission to remain in India any longer. My 48 hour flight permit was set to expire in a matter of minutes, and he insisted that I had to leave, tired or not. I knew that I was facing a 12 hour transoceanic flight to the Seychelles, but Gana prodded me on with stories of military pilots in various situations who repeatedly returned to their combat duties without sleep (implying that if they could do it, why couldn't I?). Preferring fatigue to the loss of my airplane and possible legal charges being brought against me, I literally flew into the sunset off Trivandrum's southwesterly aimed runway, a tired, but determined pilot. Gana's pep talk sustained me throughout that long and arduous flight. I will always be grateful to him for everything he did for me. He must have been a really terrific Air Force officer! 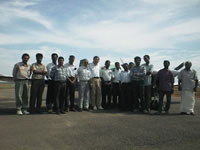 Members of Trivandrum's flying club shown flanking me on both sides in this photo. Knowing that I had very little time to fuel up and depart before my Indian flight permit expired, they met me upon my arrival there and immediately began a most impressive fueling project. Immediately to the left of me is my new friend Gana, who had miraculously pulled together this entire operation, making it possible for me to refuel and exit the country in time. I look forward to meeting this terrific gentleman again! Hand pumping fuel from a barrel, through a makeshift hose, and into the cockpit ferry tanks. Gana is shown observing at near left. These club members were mostly professionals: doctors, lawyers, engineers, teachers, etc., yet very few could afford to actually rent the club's one little taildragger airplane and take lessons. Still, they dutifully turn out whenever the club undertakes any projects, this time the fueling of a stranger's airplane with their very precious and limited supply of avgas. I will be forever in their debt.